We earlier reviewed the AVG 2011 Free Antivirus Edition, which also figured in our best free antivirus software list for 2011. Here we review the pro version, which you could download free and try for 30 days. If you are looking for even better protection from AVG, you could download avg 2011 internet security. If you are looking for other free antivirus solutions, check our reviews and download avast antivirus, avira antivirus, bitdefender and Microsoft Security Essentials. If you are on a netbook, you could also check out the free cloud based Panda cloud antivirus. AVG Anti-virus 2011 offers anti-virus, anti-spyware and anti-rootkit protection against the worst kind of viruses, malware, spyware and root-kits. It provides real-time protection to computers against all kinds of threats, known and unknown. While the free edition offers core protection, you may discover here that the pro version offers more comprehensive protection to your computers. Read its review below to find out what it can do. While AVG Antivirus 2011 offers antivirus, anti-spyware and anti-rootkit protection as part of its core protection, it also provides an online shield to protect your computers from threats originating anywhere on the web. You can thus safely download files from any website, as AVG antivirus completely scans them for the presence of viruses or any other forms of threats. AVG also ensures that online chat links are safe and any file shared via Instant Messengers (chat clients) are thoroughly scanned, before they are downloaded to your PC. While we have experienced the core protection and online protection of AVG antivirus even with a few earlier editions like AVG 9.0, AVG Free 8.5 and AVG 8.0, avg antivirus 2011 offers something new in the form of social networking protection. For example, Facebook is one popular online social networking destination for a huge majority of the internet population these days. Here people share their statuses, photos and videos with their network of friends and relatives. Though these are shared with good intentions most of the time, there are people who try to take advantage of this new form of sharing, by planting links to malicious media files and/or websites. These links may look harmless until you click on them to reach those malicious websites or download the infected photos and videos. Once you do so, your PC may get infected almost instantly. Realizing this new form of threat, avg antivirus 2011 offers a new kind of real-time protection that scans every link shared on Facebook or Myspace. Thereby, it ensures that any shared item is harmless and protects your computers from getting infected. The antivirus software isn’t far behind other solutions in the market, when it comes to the effectiveness of its protection mechanisms listed above. They use the latest technology in their scanning engines and these are backed by heuristics detection, data collected from the AVG community (AVG community protection network) and cloud security. All these ensure that your software is up-to-date, with protective solutions for any new threats. Thought the detection rates are decent, avg antivirus does produce a number of false positives. AVG antivirus scans are also not as fast as other free antivirus products, but the scanning engines are smart and works on a low priority when you are working on the PC while taking over when you are away. Here is a summary of the features offered by Avg anti-virus 2011. Apart from its features, what users like the best about AVG antivirus are the ease of installation and use. The user interface is so simple and intuitive that even a novice computer user may find it amazingly easy to install and use. Being a paid version, you will also be entitled to free support and assistance via emails, FAQs and knowledge base. AVG 2011 Antivirus is intended to protect computers running the following operating systems. Download avg antivirus 2011 free trial here and use it for 30 days. If you are satisfied with this security software, you may then proceed to buy it. While the above is a free trial of the commercial software, you can also get the free edition of AVG Antivirus software. After downloading the installation file to your computer, double click on it to start the installation process. You will be guided by an installation wizard to complete the installation. 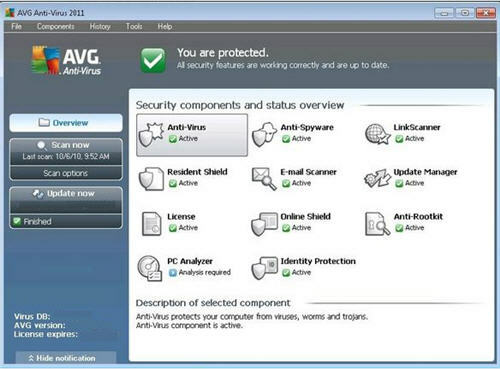 Once installed, AVG Antivirus 2011 will start protecting your PC from viruses, malware, root-kits and the like.